Granite kitchen countertops are an attractive addition to any home. The granite that mined to manufacture countertops is typically over 250 million years old. The fact is that granite is solidified molten rock that cooled over millions of years. Today, granite is located all over the world in quarries in places such as Africa, Canada, USA, Africa, China, India and many other countries. The granite is blasted and drilled from the quarries and removed by giant blocks before it becomes a fixture in any kitchen. These blocks are typically less than ten feet long but the size is dependant upon the size of the granite quarry. After the blocks are cut into slabs, they are sent to the automated polishing machines where they get polished to the set thickness required. Now the granite is ready for the manufacturing process that transforms this natural rock into beautiful granite kitchen countertops. It is imperative to understand the structure of granite kitchen countertops before having them installed into a home. The structure of granite is crystalline in nature and displays miniscule pockets between the mineral crystals that make up granite. This translates to a countertop that is manufactured entirely of natural rock and therefore shows slight imperfections. These exact imperfections in the natural rock are what most people find to be the most eye-catching feature about granite kitchen countertops. Small cracks and fissures are the norm within the actual structure but they do not compromise the durability or function of the kitchen countertop. Granite kitchen countertops are definitely not uniform in color or pattern and as mentioned earlier, show slight imperfections such as fissures and pits between the different crystals. If a uniform pattern and color scheme is what is being sought of a kitchen countertop, it would be wise to seek the professionals of engineered stone countertops. This type of kitchen countertop does not reflect the natural beauty of the rock but rather dictates a constant pattern and color scheme. Another thing to consider when researching granite kitchen countertops is the weight of the stone. The typical kitchen countertops that are available in granite are two-to-three inches thick which makes the piece extremely heavy. For example, if it is a six-foot granite kitchen countertop, it will weight between 110-115 pounds. A renovation job should have a qualified carpenter assess the cabinetry to determine if it can adequately support the weight from the granite kitchen countertop. Many people are under the impression that granite is unbreakable and this is a myth. Granite kitchen countertops are extraordinarily durable however it can be broken if it is dropped prior to installation. Granite cannot be physically manipulated so trying to twist or contort the countertop with cause it to crack. One of the best features about granite kitchen countertops is the durability of the polished finish. It does not scratch easy and one can even use sharp knives to cut without a cutting board. This practice will not damage the granite kitchen countertop at all however, that is not saying much for the sharp knives! What can damage the granite are the cleaners and chemicals that are used in today�s kitchen. When abrasive cleaners are used, the granite kitchen countertops can lose the remarkable luster. The real advantage of granite kitchen countertops is not only the value it brings to any home, but also the fact that it cannot be scratched, burned or stained. The only potential problem arises when liquid remains on the countertop for extended periods of time. The danger is that the granite is porous and may take in a bit of the moisture. Typically, when the liquid is cleaned up, the granite will dry up and show no signs of the moisture. A stone sealer should be applied to prevent the stone from absorbing any liquids after installation. By applying regular maintenance with sealers, the granite kitchen countertop is a beautiful, long lasting solution for any kitchen. Its polished stone finish gives it the clear advantage over synthetic or laminate countertops, as it will not heave or burn when a hot pot is placed on the surface. 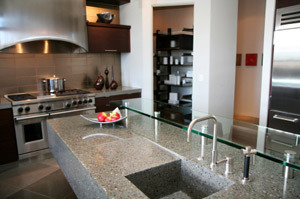 Granite kitchen countertops are a beautiful addition to any new or existing home.